In 1881, the Berlin entrepreneur Emil Rathenau (1838-1915) acquired the license to Thomas Edison’s patent for the electric light bulb. Two years later, Rathenau founded the German Edison Company, which went on to become Germany’s General Electric Company [Allgemeine Elektricitäts-Gesellschaft Berlin or AEG] in 1887. Electrical power provided the force behind Germany’s “second” industrial revolution, as cities and industries demanded ever larger amounts of power for electric lighting, electric trams, power tools, telephones, and other consumer products. In 1888, Louis Schmidt proposed this color lithograph as an advertising poster for AEG. 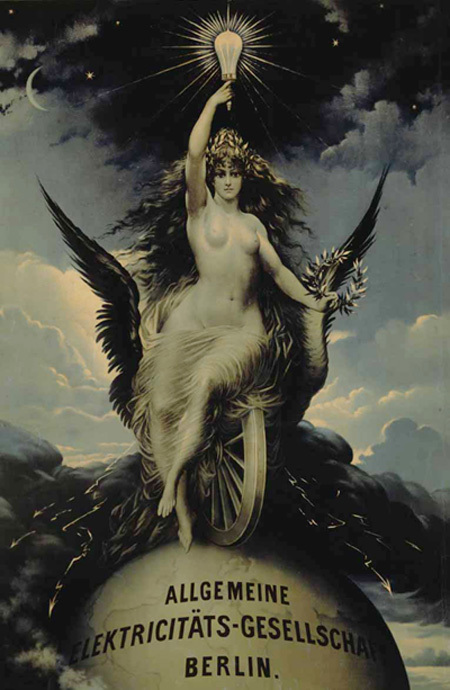 Schmidt’s integration of classical and modern themes is striking: the goddess of light sits on a winged wheel that symbolizes the triumph of technological progress (just as it had in the early days of the railway). The image sought to convey AEG’s commercial solidity while also highlighting its cutting-edge technology.